When choosing which carbohydrates to eat, two factors to consider are a food's glycemic index and glycemic load. These metrics assess how quickly and how strongly your blood sugar rises after eating a particular food. Refried beans, prepared from cooked and mashed pinto or black beans, contribute significant protein and fiber to your diet. Plus, the low glycemic index and glycemic load of refried beans adds to their nutritional value. The glycemic index of a food compares its effect on your blood sugar level to that of pure glucose. Glycemic load relates to glycemic index, but it takes into account how much digestible carbohydrate a food contains. A food may have a high glycemic index, but, if very little sugar exists in a typical serving size, its glycemic load may be low. A glycemic index of 70 or above, compared to glucose at 100, designates a food with a high glycemic index. An index of 55 or below denotes a low-glycemic-index food. For glycemic load, a score of 20 or more is high while 10 or less is low. Both the glycemic index and glycemic load of refried beans are low. A half-cup serving of canned refried beans provides 6 g protein to your diet and only 108 calories. This amount of refried beans also offers 20 percent or more of your daily fiber, iron and manganese. According to the University of Sydney's Glycemic Index Foundation, a 150 g serving of commercially available refried beans has a glycemic index of 38 and a glycemic load of 10, making them a healthy addition to your dietary plan. Eating foods that cause a rapid and significant elevation in your blood sugar may have detrimental effects on your health if you consume them regularly. A pattern of high-glycemic-index food intake is associated with an elevated risk of obesity, cardiovascular issues and Type 2 diabetes. Incorporating foods with a low glycemic index and load may help prevent these adverse health events. The beneficial glycemic profile of refried beans, whether you include them in your meal plan as a staple or as an occasional menu item, may help you maintain optimal health. The high fiber content of refried beans helps modulate how quickly the sugars you consume enter your bloodstream. The physical form of your food also affects how quickly your body digests the carbohydrates. 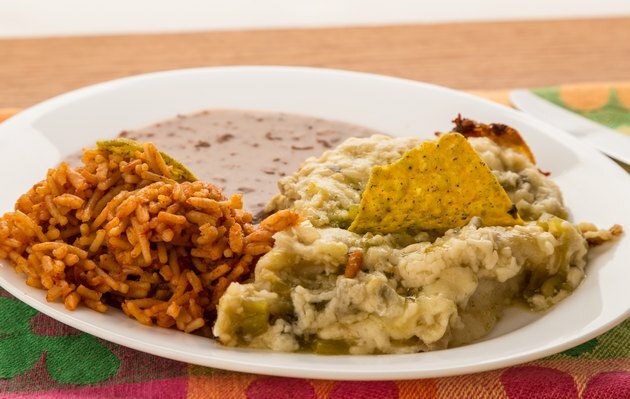 For example, the more thoroughly your refried beans are mashed, the more quickly you digest them. Leaving some beans partially mashed helps slow down the rise in your blood sugar as you digest your food.